It always amazes me just how resilient people are in the event of a major crisis, and today was no exception. Driving in to the area where Cyclone Winston came crashing through Fiji, we’re still about 20 km from where the eye of the Category 5 storm made landfall (near Rakiraki on Viti Levu) and the scale of the impact is already very evident. Nearly every house is damaged, many completely destroyed. Schools and churches have lost walls or roofs. Whole classrooms are gone in some places. Trees have been stripped of foliage and massive boughs have been ripped clean off by the force of the storm. In many cases it was these branches that caused the damage, as they smashed into houses, driven by winds up to 230 km/h. Powerlines still snake across the road and it will be a while before everyone has their power back on. Water tanks, which people relied on for collecting rainwater, have been lifted from their standings and lie in shredded pieces across valleys and in drainage ditches. Looking around, hillsides are littered with roofing iron; or whole sections of roof and wall, as well as personal belongings, washing machines and TVs, clothes, notes for schoolbooks and teddy bears. In this scene of devastation, the reconstruction of hope resounds with swinging hammers and gleams off piles of rescued building material. The government have mobilised teams for clearing the roads and utilities companies are removing the windblown debris from power poles and restringing power lines. In Tokio village (Ra province), the community is coming together to salvage what they can to reuse and rebuild. Here I was greeted with a smile and a handshake by three-year-old Samuela. He and his family are living in a roughly-assembled room while his uncle, Iosefo, oversees the clearing of the old house. I was told that during the storm, the family huddled together for protection in the two-foot space beneath the house as they waited out the storm. They then moved to the school further down the road which was being used as an evacuation centre. Normal, daily life also continues. Every village we drive through has a similar scene of washing being hung out to dry on hastily strung up lines. A scene familiar to all that demonstrates that life does go on. In the midst of devastation there is a need to keep on keeping on. Or maybe it’s from this mundane and routine activity that people are able to find some foundation to rebuild. Further on, I’m introduced to Sakobo Waqa (68), a strong, wiry man who lives alone in the valley. 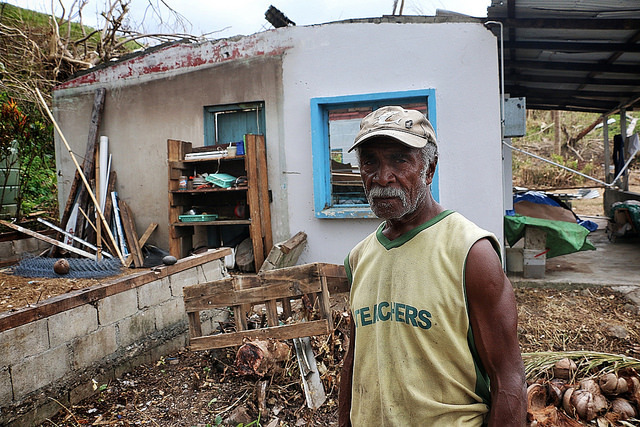 He has seen his fair share of life and has been through cyclones before, but nothing like this he says. It took 10 minutes for the worst of the storm to go over his house and he hid under his bed as he waited it out. “I was scared and prayed” he said, as he heard the wind and rain, and then the roof finally succumbed to the battering. The storm surge came through soon after. It was up to his knees and washed away many of his possessions, also destroying the crops he was growing around his house. But Sakobo isn’t the kind of man to be beaten. The government has brought some basic food, which should last about a week, he says. Caritas is partnering with the Archdiocese of Suva to actively respond to the devastation brought about by Cyclone Winston, and as we travel around, I speak with their Response Manager Iosefo (Joe) Nainima about the situation. He has “great pity for the people” he says, “many who have been affected were already poor, and this has just made their situation worse”. But he also has a lot of hope. “God brings life again and the diocese is helping to rebuild their lives, to increase their hope, to provide a new start. We’ll meet immediate needs by providing shelter materials and tools first, and work with the communities to help them get back on their feet”.